If you appreciate the superior quality of a BendPak XPR-9 or 10 series two-post lift but need more lifting power, the XPR-12FDL is an open-top car lift that’s packed with pure, brutish muscle. Like its Clearfloor sister-lift, it offers superior Direct-Drive performance. The XPR-12FDL is the perfect lifting application for everything that falls in its weight class. Two robust posts are capable of raising some truly massive trucks and SUVs. This might be classified as our “medium-duty” lift, as it covers almost every vehicle in the homeowner/residential arena. It also lifts some commercial vans and trucks, including high-rise vehicles like Sprinters. However, even though this car ​lift is made to handle massive vehicles, it belongs in every auto shop or serious DIY garage that lifts trucks, farm equipment, work vans, etc. It might be the most versatile ​lift you ever own, given that its low-profile arms will easily reach the lift points of low-stance race cars and sports cars (including both foreign and domestic models). The columns are set wide to fit trucks and SUVs, but the dual triple-telescoping arms reach farther than the arms on our lighter-duty lifts. With the XPR-12FDL, you’re not sacrificing the ability to service smaller vehicles as you gain the ability to service large ones. The XPR-12FDL is an open-top design. An open-top lift does not have a crossbar over the top of the lift, which is desirable for taller vehicles. The hydraulic lines run on the floor, under a floorplate, between the posts. We prefer Direct-Drive technology for our two-post lift, as opposed to lifting chains and screw mechanisms. Direct-Drive hydraulic technology has very few moving parts, so there’s less that can go wrong or require service over time. We carefully engineering the dual-synchro equalization system to ensure safe, level working conditions at all times. 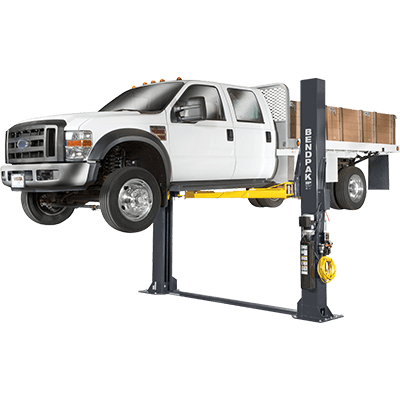 Our lighter-duty two-post ​lift models feature a mixture of two-stage and three-stage telescoping arms. Because a lift needs to make room for wide trucks, vans and SUVs, we set the columns farther apart. We can still reach virtually all lift points on smaller vehicles by only including three-stage arms. The XPR-12FDL makes safely reaching under low-profile cars safe and easy. The dropped-end design ensures vehicle doors and chassis don’t get scratched or dinged during placement of the arms and pads against the lift points. We won’t risk compromising your safety just to get a few extra bucks with a separately sold accessory that’s actually necessary. So, we include a versatile and essential two-post ​lift accessory kit for your convenience. In this kit, you get four ​152 mm stackable adapters, four ​76 mm stackable adapters, four polyurethane contact pads and four frame cradle pads. You no longer have to worry about lifting trucks with running boards or those auxiliary fuel tanks, which made car lift operation a pain. By lowering the arms tubes, we ensure vehicle doors can open and close without catching the supports. The arm restraints on a two-post lift are one of the most essential safety features. These restraints are essentially what keep the arms locked during lift. They lock automatically while the arms ascend the lift carriage, and they disengage when the ​lift is fully lowered. Sometimes the magic of BendPak construction exists in the details. Taller lift carriages reduce stress on the columns, so we make ours 1,346 mm high. That’s taller—and safer—than our competition. UHMW load bearings, unlike older-style roller bearings, don’t need lubrication and quite literally never degrade over time. They last forever and aren’t negatively affected by chemicals or oils. How long do you want your columns to last? Decades? Good, that’s how we feel too. And that’s why we make our columns out of a single piece of steel. It makes for a stronger, longer-lasting structure overall. The safety release on every XPR-12 car lift is single-point and easy to use. We keep our operations simple, so you stay safe at all times. Our high-grade overhead shutoff bar stops all action on the lift at the moment a vehicle comes into contact with it. For faster operation that doesn’t compromise safety—and in fact increases it—we include, free-flow, high-pressure 10 mm hydraulic lines, a high-flow pump and integrated AC power unit.